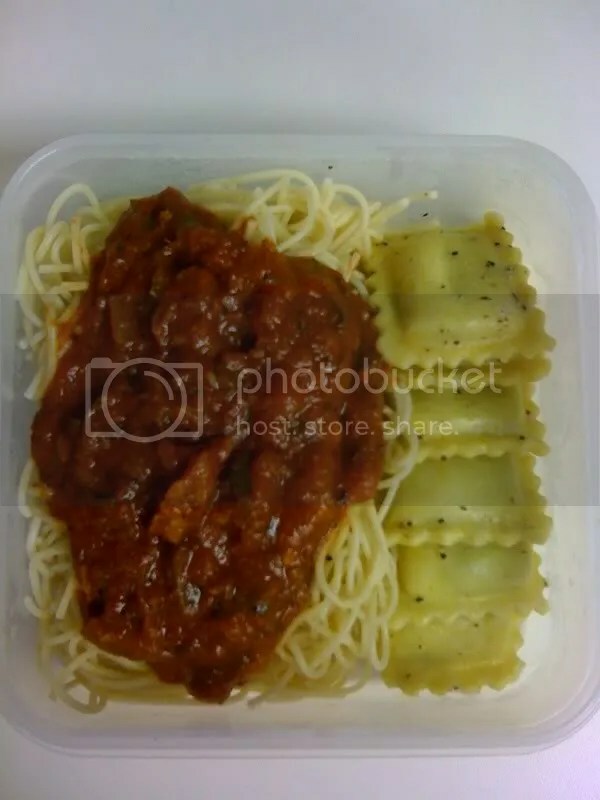 This bento has vegan butternut squash ravioli with spaghetti and marinara sauce. The vegan butternut squash ravioli are great, but for $4.99 a serving it’s kind of expensive. I started feeling better last night, so this bento turned out pretty neat. Last night we had corn on the cob and mashed potatoes with gravy for dinner, among other things. So for this bento, I started out by cutting the corn off of a half a cob and mixing it with the mashed potatoes. Then I spread the potatoes in the large part of my bento and filled the heart container with gravy. I got some new soy dogs so I fried one of those up and added it in there. After that I made a little salad with alfalfa sprouts, carrots, cherry tomatoes, onion, celery, green onion, and zucchini (the star shapes). I filled a little pig container with some vegan salad dressing and added it in. Then I sliced some strawberries and kiwi and filled the last little container. Last night I was inspired by birds when I was making this bento. Birds are really cool, so I thought it would be nice to make a little nest of my own. I had some alfalfa sprouts that need to be finished off, so I used them to make the nest and then cut some baby carrots in half to make the “eggs”. I think it turned out cute. I put some vegan ranch dressing in a little piggy sauce container to eat with the veggie nest. 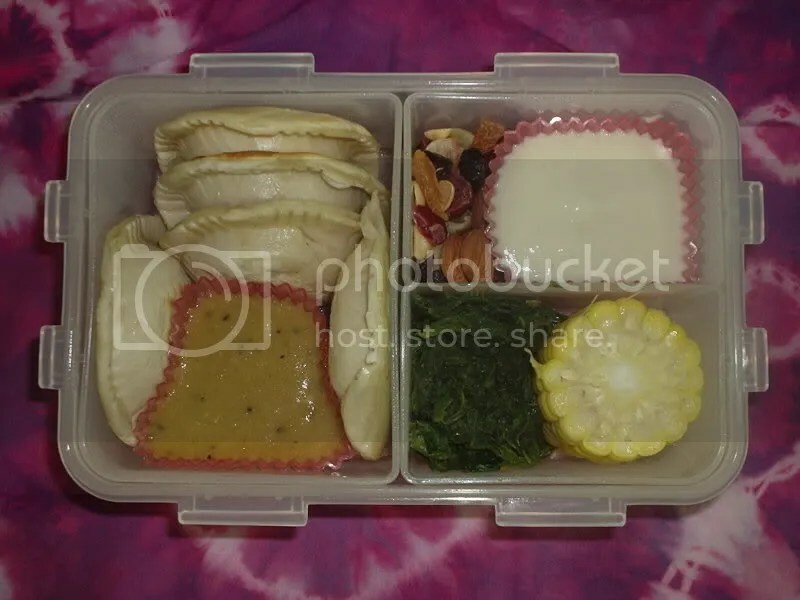 Then I found some kiwi and bananas in the fridge and had to put them in the bento because they’re some of my favorite fruits. Kiwi and banana is a good combo too. 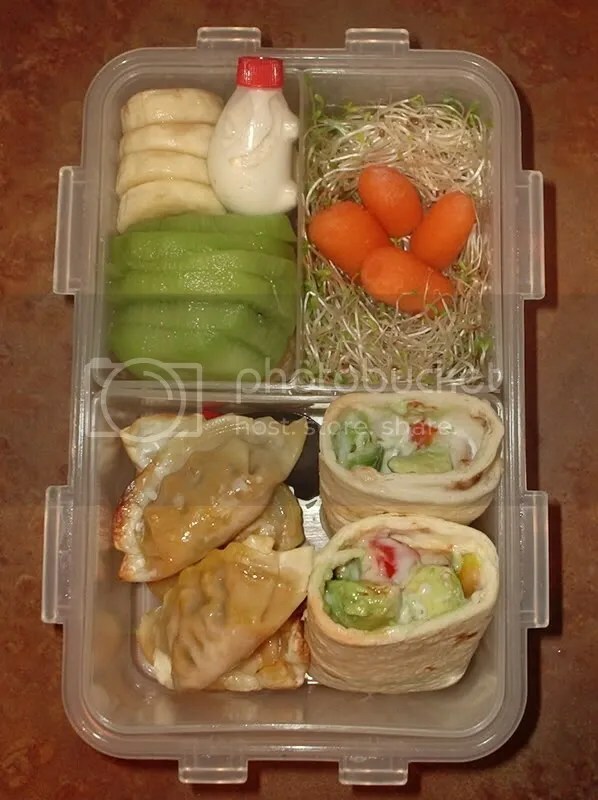 For the main dish, I decided I would have some kimchi potstickers, but as I was making my bento I forgot and got out a bunch of food for tortilla wraps. Then I remembered about the potstickers, so I made a little of both. I’m really happy with how the wraps came out and will definitely make them again. I got a tortilla and put a layer of plain soy yogurt on it. Then I sliced up some avocado and cherry tomatoes and lined them up in there. Then I added some of the vegan ranch and some tobasco sauce… delish! 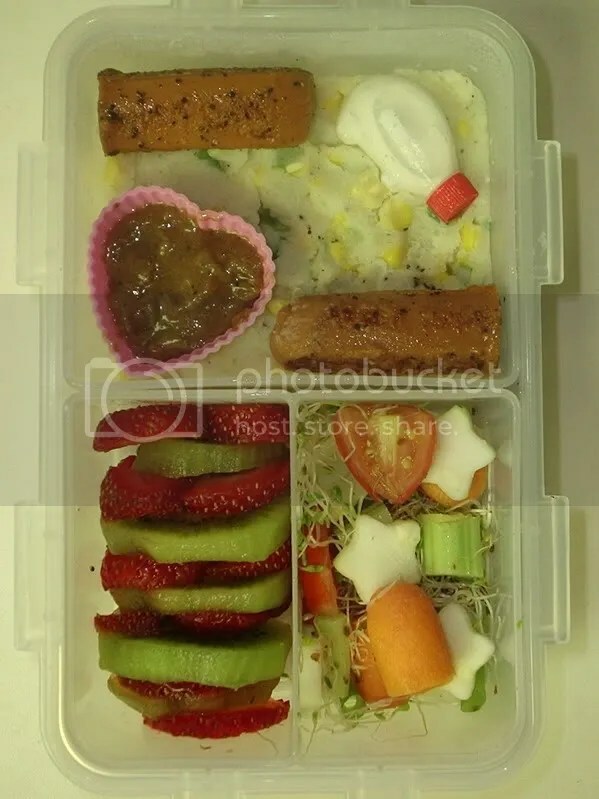 I am really happy with how this bento turned out. I think it’s reminiscent of a zen garden. 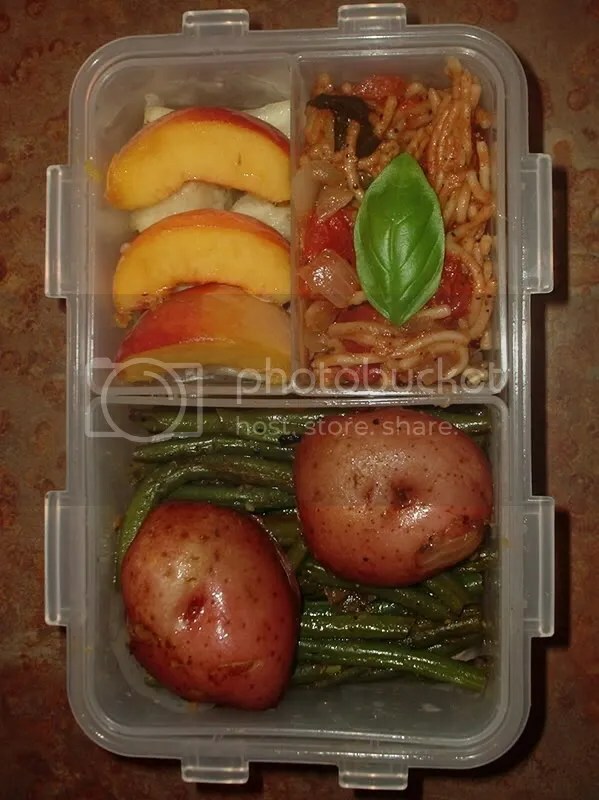 I used fresh green beans and red potatoes for the main part of this bento – it is the part that reminds me most of a zen garden. The green beans are like the sand and the potatoes like the large boulders. Then there’s some tomato and vermicelli noodles with a fresh basil leaf. For dessert I placed some peach slices on top of a pile of pineapple. Because my bento yesterday was a little light, I was in the mood for something heavier, something more “homestyle”. When my Mom made steamed greens, corn on the cob, mashed potatoes and gravy for dinner, it left me with great leftovers for my bento. I added the greens and corn to my bento, but instead of the mashed potatoes I made some potato pierogis that needed to be eaten and some gravy. Then for a sweet snack I put some soy yogurt and mixed nuts/dried fruit. Now I can’t wait till lunch comes along so I can eat! I made this bento a couple days ago, but I’ve been super busy lately and haven’t gotten a chance to post it yet. I had some vegan mac and cheese, corn on the cob, and greenbeans leftover from dinner, so this bento was a breeze to put together. 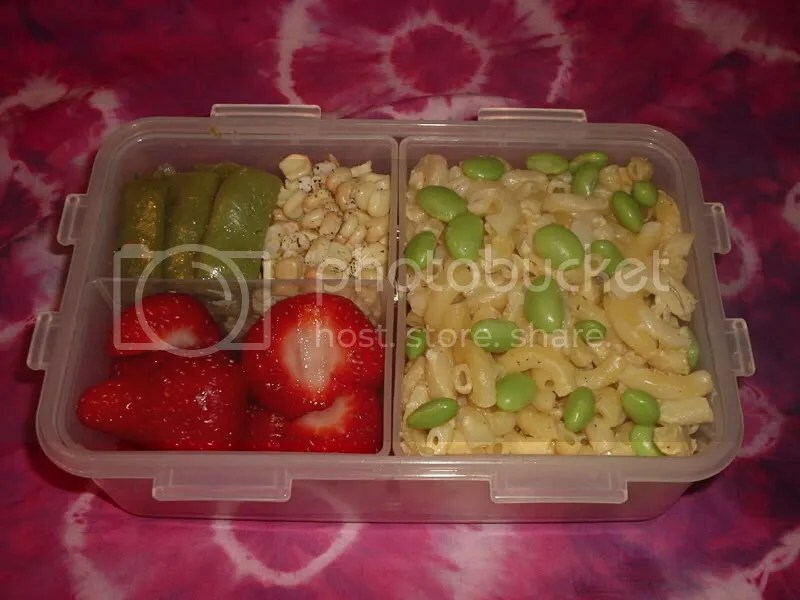 I had some edamame in pods that I didn’t eat from the bento the day before too and didn’t want to trow them away, so I popped the beans out out the shell on top of my mac and cheese. Then I cup the corn off the cob and added that along with the green beans to my bento. All I had to do after that was cut up some strawberries and I was done. Although this bento was ludicrously easy to make, it was also ludicrously yummy! 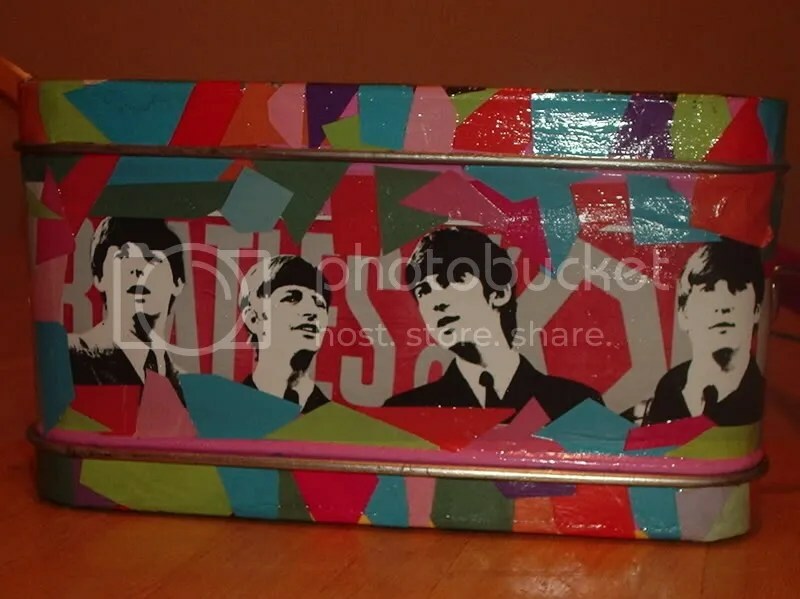 This project was inspired by two items that I feel are totally different – a Beatles calendar and a tin lunchbox I bought in middle school. 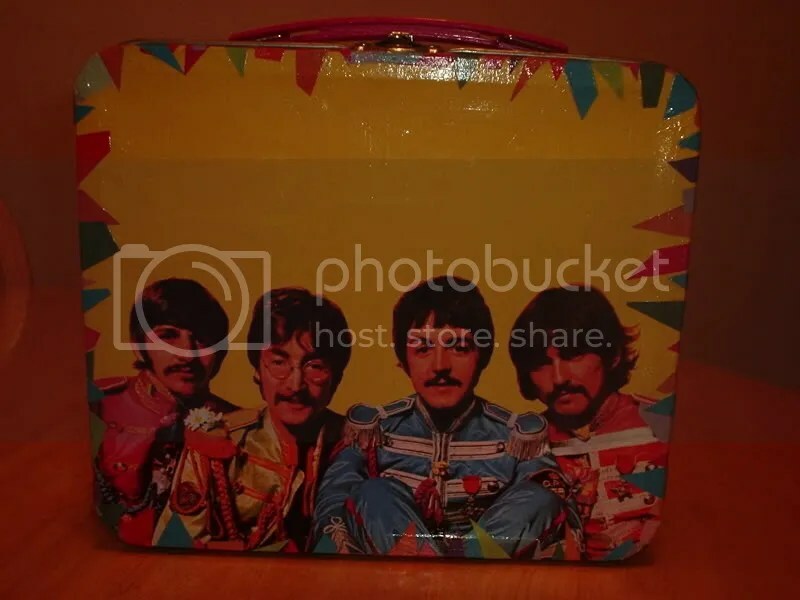 Sadly I do not have a before picture of the lunchbox, but let me tell you, it was horrible. It said “Princess of Everything” on it and was bright pink with a crown. 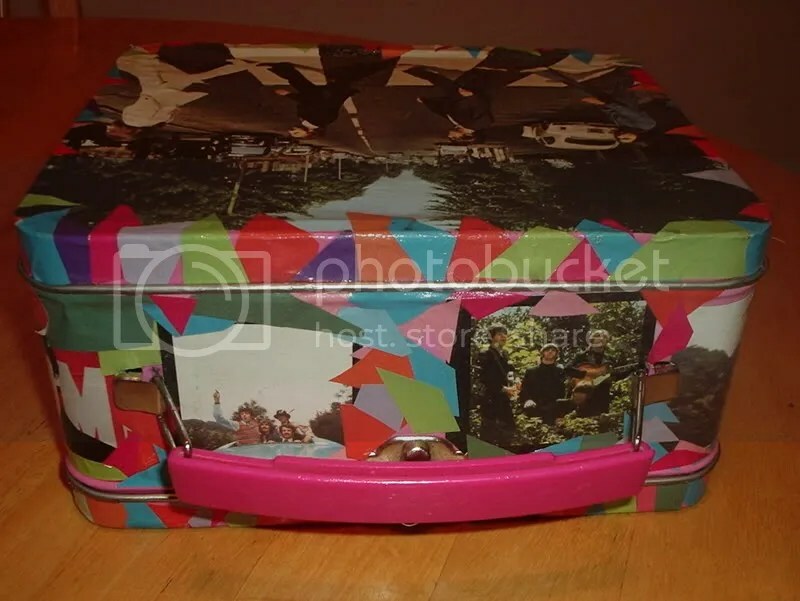 I don’t know what I was thinking when I spent $20 on it… The calendar was my boyfriends and when the year was over I couldn’t let him discard it because of the great pictures. After a few months I finally came upon both items and realized the lunchbox could be saved. 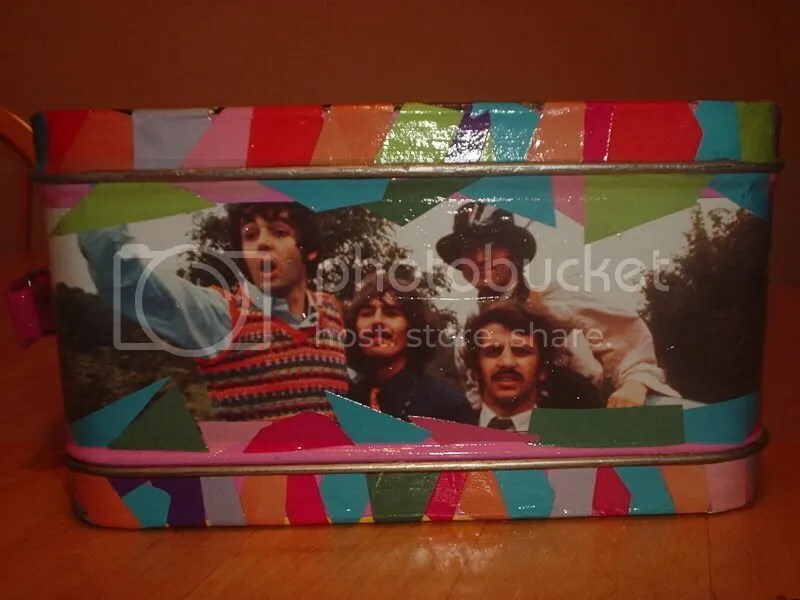 I cut out my favorite pictures, then went to work cutting out little pieces of paper in different colors to make a border. 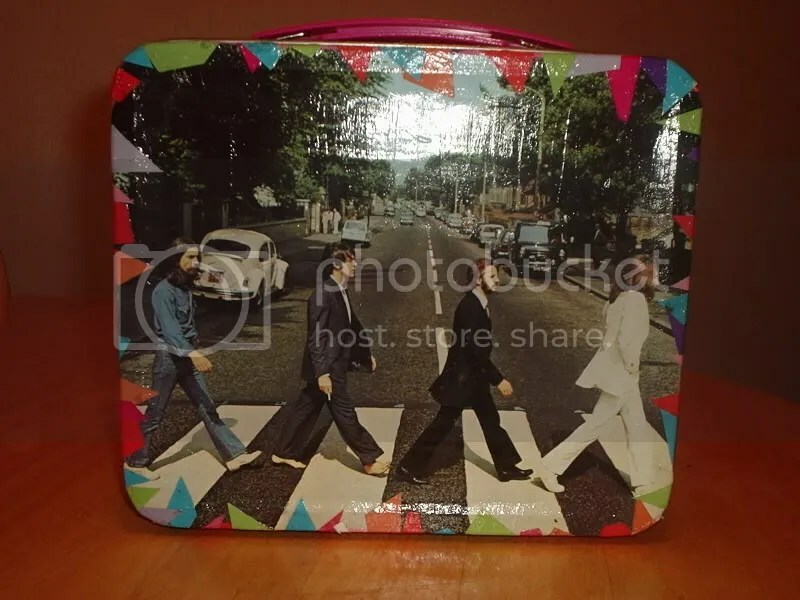 Then I used one of my favorite products, Mod Podge, to attach the pictures and paper pieces to the lunchbox. A few hours later this was the result. 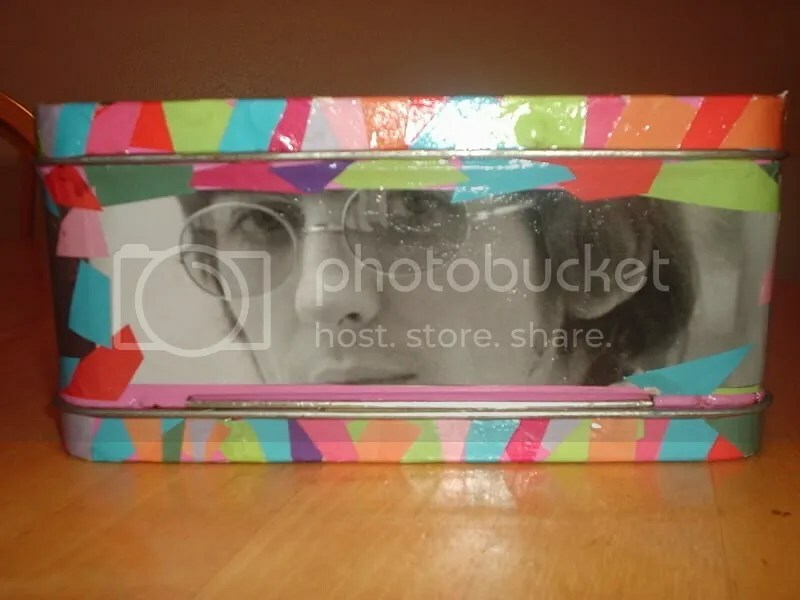 I am really pleased with how this box turned out, and actually wish I had more of these tin boxes to decoupage. Please let me know if you like it too!